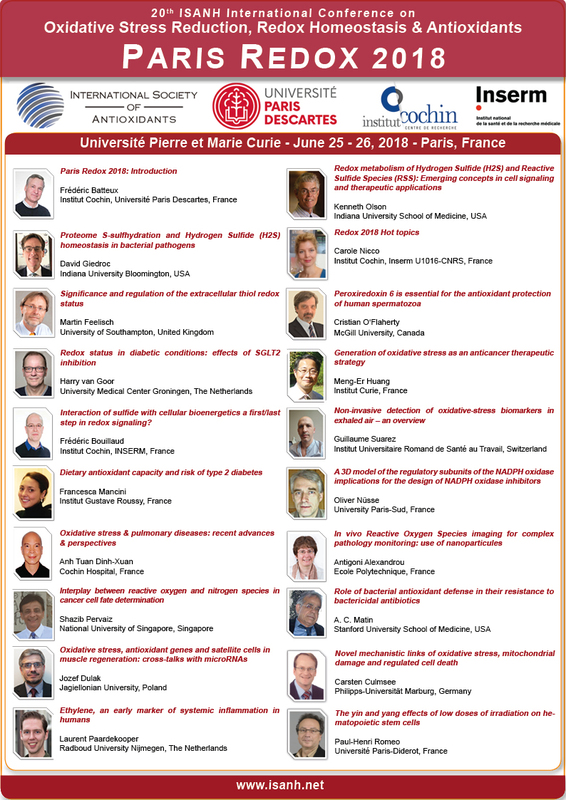 The Scientific Committee of Paris Redox 2019 will be welcoming Prof. Chantal Houée-Levin, from Laboratoire de Chimie Physique in Orsay, France, for the 21th International Conference on Oxidative Stress Reduction, Redox Homeostasis and Antioxidants. Professor Houée will be presenting her studies entitled "Is NADPH oxidase activity regulated by free radicals?". NADPH oxidase is a ubiquitous enzyme that is the main producer of superoxide anions in cells. In response to proinflammatory mediators, the NADPH oxidase complex is activated. In cells, arachidonic acid (cis-AA), released by activated phospholipase A2, plays also a role in activation of the NADPH oxidase. We are currently investigating how the production of superoxide, precursor of all ROS and hence of oxidative stress generated by the NADPH oxidase are regulated.